Most Lovable Cat Died In "Hit And Run"
I just wanna blog this because i love cat and wanna keep this story of the most extraordinary cat ever in England. The original post is here. Feel sad with this news. A cat which became famous for catching the same bus every day for four years has been run over and killed - while crossing the road to catch its daily lift. Crafty Casper died in a hit and run accident as he tried to board the No3 service. He hopped on the bus around 10am every morning and sat on the back seat throughout its entire 11 mile route. The freeloading Feline would travel around his home city of Plymouth, Devon, for up to an hour before arriving back at the same stop. 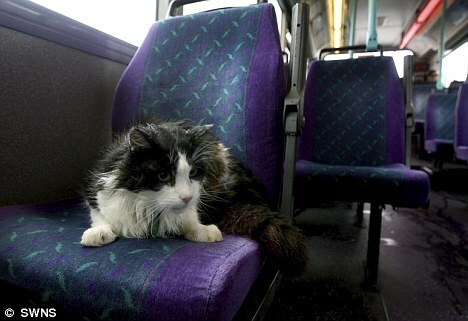 But after an estimated 20,000 miles on the bus Casper was killed crossing the road to catch his daily ride. Devastated owner Susan Finden, 65, said whoever ran over her cat failed to stop and help him. She said: 'Many people knew Casper, who loved everyone. 'He enjoyed the bus journeys. Sadly a motorist hit him and did not stop. 'Casper died from his injuries. He will be greatly missed - he was a much loved pet who had so much character. During his regular trips the 12-year-old cat passed an historic dockyard and naval base, a city centre, several suburbs and a red light district. He took his daily rides for so long that all First Bus drivers were told to look out for him to ensure he got off at the right stop. Grandmother-of-three Susan added: 'I called him Casper because he had a habit of vanishing like a ghost. 'But then some of the drivers told me he had been catching the bus. 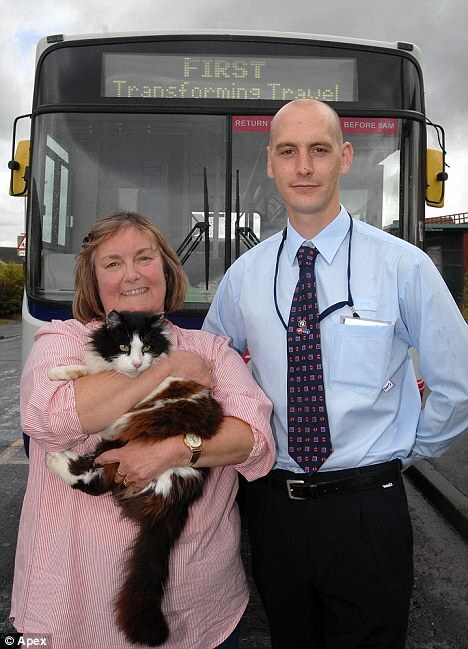 Care worker Susan got Casper from a rescue centre in 2002 and drivers say he started riding the bus in 2005. She has now put up a sign at the bus stop breaking the bad news to other commuters who regularly shared a ride with her pet. Mrs Finden said that despite his regular bus rides Casper had 'no road sense whatsoever'. She said: 'Casper was quite quick for his age but I was trying to stop him from riding the bus so much. 'He had no road sense whatsoever but he loved people. Susan believes Casper may have begun life at a haulage yard as he was so fond of large vehicles.